Queen Victoria’s portrait taken to mark her Diamond Jubilee in 1897. The celebrations for this year’s Diamond Jubilee are much in evidence with promises of bonfires, fireworks and flag-waving taking place almost everywhere. 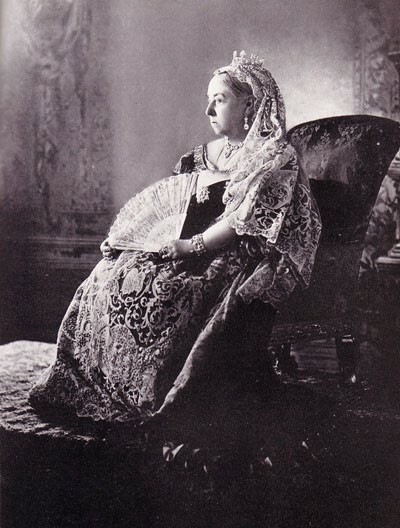 It would seem that the atmosphere was much the same in June 1897 when Queen Victoria celebrated her sixty-year reign. Her great Jubilee procession which included troops from all over the empire, snaked its way through London, pausing for an open-air thanksgiving service outside St. Paul’s Cathedral. Attending that service was the Archbishop of York, Dr. Maclagan, while at home in Bishopthorpe, his parishioners were enjoying their own modest celebrations. The day started similarly with a thanksgiving service at St. Andrew’s Church. Perhaps the vicar, Rev. Keble, reminded villagers of the occasion when, in September 1835, just two years prior to her accession, the young Princess Victoria stayed for a few days at Bishopthorpe Palace as guest of Archbishop Harcourt. The Princess and her mother, the Duchess of Kent, arrived at the Palace escorted by the Yorkshire Hussars, no doubt watched with some excitement by many local residents. The Princess was here to attend the Yorkshire Musical Festival. According to her diary, Victoria did not particularly enjoy the concerts – she wasn’t a fan of Handel – but she must have enjoyed a good night’s sleep. The Archbishop, it was reported, set about renovating the Palace for the visit and ordered two elegant state beds. Victoria’s was covered in white velvet and her mother’s in blue. They both laid their heads on pillows embroidered with rich Valenciennes lace. Sixty-two years later in 1897, there were probably not many residents left who personally remembered that royal visit but, nonetheless, the inhabitants of the time were ready to celebrate Britain’s longest-reigning monarch. Following the thanksgiving service, and in traditional Bishopthorpe-style, they set off down Acaster Lane and played a game of cricket. The next important event was tea! Needless to say, a Diamond Jubilee Committee had been set up to organise the day’s events. Headmaster Mr. Fred Taylor and the butcher Mr. George Scholey were in charge of the proceedings. They ordered large quantities of food from suppliers in York: 16 loaves, a 40lb plum cake, 200 cheesecakes, 100 pork pies and a huge ham for sandwiches. The women of the village were not to be outdone for they also ordered copious quantities of flour, lard, milk, yeast, currants and candied peel to bake buns and, appropriately enough, queen cakes. This feast was consumed with some enthusiasm in Farmer Lofthouse’s granary but, as the villagers numbered about 400, they had to eat in two relays. When appetites were satisfied, the children were delighted to be presented with souvenir mugs. Once again, they returned to the cricket field where all kinds of sports were enjoyed. Throughout the day, the band of the West Yorkshire Regiment had accompanied the fun by playing many lively pieces – but possibly not those by Handel! The gathering concluded with three hearty cheers for Her Majesty and then joined in with a rousing chorus of the National Anthem. Was it possible that the Queen enjoyed her Diamond Jubilee day just as much as the villagers of Bishopthorpe? Yorkshire Gazette: Saturday, 5 September 1835, p3. Yorkshire Gazette: Saturday, 26 June 1897, p3. Borthwick Institute for Archives: BIS/34 Misc. bills, accounts & receipts.